There are many different methods of making bread with different styles and tastes. This method makes soft, springy and fluffy bread. This method was introduced by Yvonne Chen in Japan in her cook book called the "Bread Doctor" she describes tangzhong as the secret ingredient to soft bouncy bread. It's actually using a "flour paste" or water roux. You cook 1 part hard red or hard white in 5 parts of water to 149 degrees F. to form a thick paste, which is then added to the other ingredients. Not only does this produce a soft light loaf but it will stay soft for many days. This is such a simple idea and it goes to show you it's not only the ingredients in the bread but the techniques used to make the bread. This recipe makes nice sweet rolls but would make good soft hamburger or hot dog buns also. You would never know this is 100% whole grain, so if you're trying to get your family to eat whole grain this is a recipe you might try. 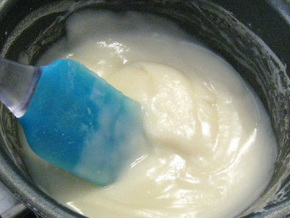 The mixture becomes thicker and thicker. Once you notice some “lines” appear in the mixture with every stir you make with the spoon it’s done. You may use a thermometer to check the temperature it should be 149 degrees F.
Using your paddle attachment mix, when all ingredients come together, (after a couple of minutes) let the dough rest 10 minutes. After the autolyse or rest, take your cold small pieces of butter and poke holes in the dough with your finger and put the butter into them knead again until all the butter disappears into the dough. Let the dough autolyse again, 10 minutes. The dough should be elastic and you should be able to get a window pane. Since this recipe has spelt you must be careful not to over knead it. Spelt is more fragile, and the gluten can not take heavy kneading.